Isn't it funny how your plans change? this past weekend so I didn't have the time I needed to get to the sewing machine. and it moved me so much that I decided to share it with you! 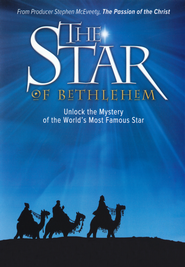 The movie I'm talking about is Star of Bethlehem and actually it is a documentary. while good, it often makes one think boring. And that is far from the case with this one! it draws you in and keeps you interested the entire time. Here is the general description of the film. "For centuries, skeptics and seekers alike have pondered the star of Bethlehem. The Bible describes unusual or even impossible astronomical events at Christ's birth. Was it a miracle or mere myth? This compelling DVD - from producer Stephen McEveety ("The Passion of the Christ") - examines Scripture, ancient writings, indisputable astronomical facts and more. how it established a date for Jesus' birth and death . . . and its significance for you today!" We were first introduced to the Star of Bethlehem the Christmas season of 2012, I believe. But just this week I viewed it for a second time and was again amazed. I remember being shocked by the amazing presentation and in tears the first time I saw it. This second time I was again amazed and in awe of the intricacy of the plans of God. at this Youtube link. Or just watch the one I embedded below. especially since there is an interesting and significant clip in the bonus features that is not in the film. You can also visit the official website http://www.bethlehemstar.net/ to learn more. He even created the heavens and the earth. It made me stop and think about my life. what I should be doing, where I should go?! long before man even had the tools and where-with-all to be able to see it! We think we are so great and important. That our lives are of utmost importance and it would be terrible if we wasted it. But we are so very small. And He is so very, very vast. What is my life in the whole expanse of history? why should I worry that I'm where I need to be? and in control God really is! I challenge you to make that statement after having watched this piece. will explode and be greatly expanded! This movie is awesome, very well done, and just absolutely extraordinary! It totally is! I'm in awe and moved nearly to tears every.time.I.watch.